During her three decades with WestEd, Nikola (Nikki) Filby has helped innumerable teachers throughout the United States improve the quality of their instruction, thus improving the academic performance of students. Filby co-directs the Innovation Studies program at WestEd, an initiative founded in 2006 to help educators learn about and implement promising ideas from research and practice. As such, she oversees the Innovation Guides, a major series of publications produced for the Office of Innovation and Improvement in the U.S. Department of Education. The Innovation Studies program currently is developing seven guides focused on charter and magnet schools that are closing the achievement gap, expanding access to rigorous curriculum through online courses, and increasing parent involvement. The first book in this series, published in January 2007, was Innovations in Education: Charter High Schools Closing the Achievement Gap. Under Filby’s leadership, the Innovation Studies program produced six OII guides in 2004-05, which focused on public school choice; supplemental educational services; charter schools; magnet schools; alternative routes to teacher certification; and school leadership development. 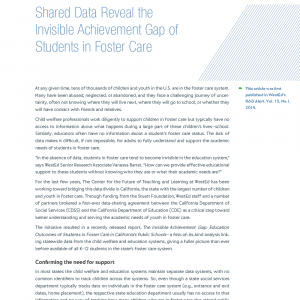 Nearly 300,000 copies of these guides have been distributed to practitioners, partners, and policymakers working within schools and school districts. The guides are available for download. One of these guides, Innovations in Education: Successful Charter Schools, received the 2005 Association of Educational Publishers award for best interior design. 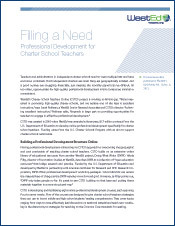 The Innovation Guides proved so successful that OII asked Filby and her team to create BuildingChoice.org, a web-based toolkit for district administrators and others seeking to expand or improve their public school choice options for parents, teachers, and students. 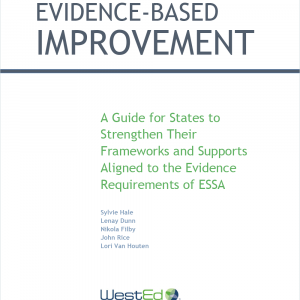 Based on the quality of these projects, WestEd won a U.S. Department of Education contract to produce Doing What Works, a website that will build upon research reviews by the Institute of Education Sciences to help educators not only understand but do what works in education. 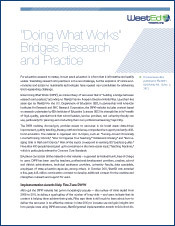 Directed by Filby, this website will highlight examples of “practices in action” from schools across the country that are implementing research-based practices in a variety of settings, and the site will show how they’ve done it. It also will offer tools that educators can use in planning and professional development to bring the practices into their own work. Along with her work with the Innovations Studies program, Filby serves as the Program Director of the Regional Educational Laboratory West (REL West) program, one of ten regional educational laboratories funded by the U.S. Department of Education. She has held this position for over a decade and guided the regional laboratory in applied research and development projects that yielded research-based information and training materials targeted to the region’s most pressing needs. In 2000, she directed three RELs to produce the book Teachers Who Learn, Kids Who Achieve, which profiled schools that had won national awards for model professional development. These products and others have been used in workshops nationwide to help administrators, teacher leaders, and policymakers develop more effective professional development and change strategies. 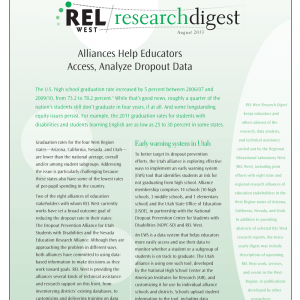 Filby began her career at WestEd as a research associate for the Beginning Teacher Evaluation Study. This major study of teaching and instructional time resulted in over 20 technical reports, two books, several journal articles, and numerous citations and professional development applications. She received a BA in psychology from Wellesley College and a PhD in educational psychology and learning from Stanford University.